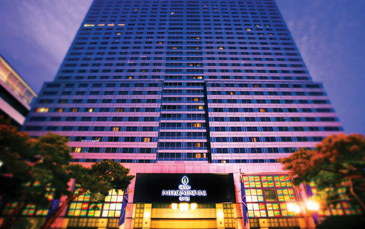 Grand InterContinental Seoul was named "South Korea's Leading Hotel" at the 12th World Travel Awards on Nov. 13, 2005. In addition, InterContinental Hotels & Resorts won the prestigious "World's Leading Hotel Brand" and "Europe's Leading Hotel Brand" awards. The company also received an additional 18 individual awards for hotels in Europe, the Middle East, Asia, South America, and the United States. Since it opened its doors in 1988, the 535-room Grand InterContinental Seoul has been regarded as the city's premier hotel and respected internationally for its excellent service and comprehensive range of business and entertainment facilities. The largest guest rooms in Seoul are fully equipped with the best modern technology, set amidst traditional decor and furnishings. "We are pleased to be recognised by the World Travel Awards as South Korea's Leading Hotel. We pride ourselves on our commitment to providing a truly authentic experience in Seoul and exceeding the needs of today's experienced travelers," commented Mr. Hans W. Olbertz., the Director of Operations Korea and General Manager. The World Travel Awards were established in 1993 to acknowledge, reward, and celebrate the enormous achievements to be found in all sectors of the global travel industry. In the years since, new technology has ensured that travel has maintained its position as one of the fastest-growing industries on earth. Also during that time, dedicated travel professionals and their clients have come to regard the World Travel Awards as the best endorsement that any travel product could receive. Candidates for nomination are based upon the previous year's voting. Travel agents in more than 200 countries around the world cast the votes. Hundreds and thousands of votes each year are registered online at the official World Travel Awards website, with most of the leading travel internet sites offering additional online voting facilities. For more information on the World Travel Awards visit www.worldtravelawards.com. InterContinental Hotels & Resorts was the first truly international hotel brand in the world, and quickly became the symbol of glamour, sophistication, and success that, years later, continue to define global travel. The brand is committed to providing its guests with memorable and unique experiences that enrich their lives and broaden their outlook. InterContinental Hotels Group PLC of the United Kingdom is the world's largest hotel group by number of rooms. InterContinental Hotels Group owns, manages, leases, or franchises, through various subsidiaries, more than 3,500 hotels and over 537,000 guest rooms in nearly 100 countries and territories around the world. The Group owns a portfolio of well recognised and respected hotel brands including InterContinental Hotels & Resorts, Crowne Plaza Hotels & Resorts, Holiday Inn Hotels and Resorts, Holiday Inn Express, Staybridge Suites, Candlewood Suites, and Hotel IndigoTM. It also manages the world's largest hotel loyalty programme, Priority Club Rewards, which has over 26 million members worldwide. In addition to this, InterContinental Hotels Group has a 47.5 percent interest in Britvic, one of the two leading manufacturers of soft drinks, by value and volume, in Great Britain.